Anthony Watt of the popular web blog, Watts Up With That (http://wattsupwiththat.com/2009/12/09/picking-out-the-uhi-in-global-temperature-records-so-easy-a-6th-grader-can-do-it/#more-13925) has postulated for years that a strong component of the measured global temperature rise was likely caused by urban heat islands. And that problem is compounded by the encroachment of development and misplacement of instrumentation. That is, instruments are placed not within urban heat zones, but the instruments are near local heat sinks such as asphalt, concrete, white surfaces, exhausts, traffic, etc. This used to be taken as a given. But sometime in the last 15 years various institutions devoted to climate science started denying the effect of urbanization on heat measurement--and totally ignored local effects. NOAA, CRU, and all other Western institutions then stated adjusting the data in a process called homogenization. This meant that rural temperature data was averaged with urban data. This always resulted in an upward temperature trend. In fact rural stations were often adjusted upwards prior to the homogenization to "norm" the temperatures resulting in even higher overall averages. 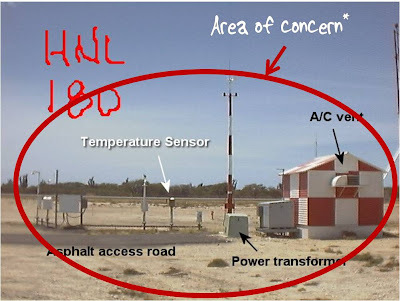 This is the process that James Hansen is frequently accused of and that New Zealand's National Institute of Water and Atmospheric Research was recently caught doing. All to the effect of "proving" anthropomorphic global warming......during a cooling trend. ClimateGate: NZ NIWA Exposed in Global Warming Hoax. Now a commenter on Watt's site posted an extraordinary video. A study by a Sixth Grader named Peter and his father that verifies the urban heat effect and throws serious doubt into the value of homogenization as a valid scientific measure. It will likely maintain its vale as propaganda, unfortunately. And the tape appears to demonstrate something even more startling: Continental land temperatures have averaged out to constant since 1900. No warming at all. Now that is interesting. All the science that scientists refuse to do?